Yesterday, Individual Computers announced several new products. Whether your into old-school Amiga computers or the legendary Commodore 64, I’m sure you’ll find something of interest. I must admit I’m quite surprised about the amount of new stuff for the Amiga these days.. it’s like Christmas came early! Due to popular demand, we’ve put a product for the C64 back into production that was previously only available from selected resellers. The PLA chip replacement SuperPLA will be back in stock starting september of this year. The revised edition will be available for 18,90 EUR (*) from all our retail partners. The target computer is set by jumpers. The new, much more compact design has the jumpers moved to the back of the board. Our new accelerator for the Amiga 500 has already been discussed in user forums, but will be released with some changes, so customer demand is met in both price and features. The ACA500 is powered by a 14MHz CMOS-68000 processor with 2MBytes RAM and a mass-storage controller for CF-cards and CD drives. Autoboot from CF-card is possible from Kickstart V1.3 and higher. Thanks to our TrueIDE technology, any CF card can be used, even if the card identifies as “removable device”. A CD-ROM drive can be connected to the easily reachable IDE port on the side of the A500. The relatively moderate increase in speed is enough to run WHDload. For those who want more CPU power, the ACA500 has a CPU-slot compatible with our accelerators for A1200 computers. This makes even our top model ACA1231 available to the A500 computer. The ACA500 will be available from all resellers for 79,90 EUR. We’re currently negotiating about including Kickstart licenses into the ACA500, so the built-in flashrom can be pre-loaded with different Kickstart licenses. Our new ACA1220 is powered by a full 16,67MHz 68020. For the A1200, this card can be considered a 128MByte-RAM expansion, but for the A500 with ACA500, this board is a turbo-tidbit that provides more memory than has ever been offered at this price: The ACA1220 will be available starting from 89,90 EUR. The ACA1220 can be expanded with a realtime clock. In an A500 setup, the RTC is already located on the trapdoor expansion, so it’s not required there. If you’re going to use the ACA1220 in an A1200, you can add an RTC for 19,90 EUR (*). Battery is not included. The RTC-module can also be used with other accelerators or even without an accelerator in an A1200. For example, if you own an ACA1230 and haven’t yet equipped it with the hard-to-find RTC chip, this module will solve your problem. As a replacement for the sold-out ACA630, we’ll have a new budget-accelerator for the A600, available in Q4/2012. 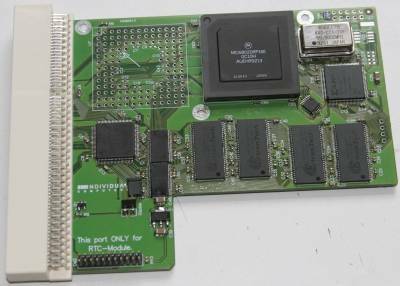 It will be powered by a 16.67MHz 68EC020 processor and provides the popular maprom function, just like all our ACA cards do: Maprom allows executing Kickstart ROM from fast 32-bit memory, increasing execution speed considerably. The ACA620provides 9+1MBytes of RAM (1MByte reserved for maprom-function). The target price is 99,90 EUR. The “big” Amiga models don’t have to stand back: We’ll have big memory for a small budget soon. The new BigRamPlus offers 256MBytes of memory for A3000(T) and A4000(T). The full-size Zorro-3 card will be available from all Individual Computers resellers at 99,90 EUR (*). Pretty cool. Too bad they don’t make new peripherals for older PC’s as well. That is an interesting idea. I’ve actually thought about getting hold of an old PC for old-school gaming. Would be cool to see what you could get out of it hardware wise. 🙂 I’ll have a look around the web to see if I can find some examples of retro PC builds. Great news about the PLA replacement chips for C64s – my C64 died about 6 months or so back and I have a feeling it was PLA-related. Not a problem for me now as I have a C128 that a kind friend passed along to me last year, but good to know for future reference nonetheless! I agree about the PLA replacement. 🙂 I’m sure there are some happy people out there because of it. Which games do you usually play on your C128 btw? Great games. 🙂 R-Type is a winner, that’s for sure. I’ve never completed it though, so I should definitely re-visit it in the future. Have you tried any of the newer games? I’m surprised to see new games popping up for this legendary computer in 2012! That is very impressive. Woo,those accelerator boards look nice – counting pennies! Glad you liked them. 🙂 It’s for sure cool stuff. It’s great to see so much happening concerning both Commodore and Amiga these days. Thank you for visiting and for leaving a comment. Much appreciated! Are you thinking of getting an Amiga again? What kind of 030 turbo-card have you got? I’m going to check out your blog btw, looks nice. If you are interested in selling that 030 A1200 accelerator, contact me at amigadave at earthlink dot net and let me know what brand the 030 accelerator is, what speed it is, how much RAM it has and what the Max RAM it can hold. Does it have a SCSI controller, or IDE controller included with it built-in, or external add-on? And what would you want for it. Thanks for commenting. 🙂 Yes, it’s amazing that there is so much going on when it comes to older consoles and computers. Impressive that new hardware is still released for a computer that saw the light of day in the early eighties! There are even new games released for them. Btw.. a new Amiga game was released a short time ago! 😀 It’s called Sqrxz and it is a platform game. Looking forward to give it a spin!